Pump: Victore, 5 hp, 53 ltr. Dimension: L 9.5 ft. x W 3.6 ft. x H 4 ft.
Tractor trailed automatic sprayer for agriculture. With automatic spray guns moving system and auto rewind hose reel. At very reasonable price. Suitable for all crops. Electrical Rotating System Pvt. 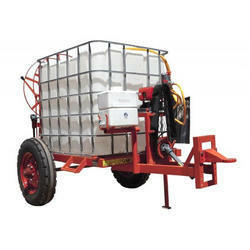 Ltd.
ASPEE tractor trailed sprayer is an air assisted sprayer (mistblower). 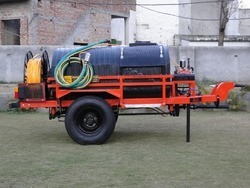 Advance technology, versatility, user and environmental friendly are the essential features of tractor trailed sprayer. It can give uniform and effective spraying coverage up to 5 meter vertically and 9 meter horizontally.